As the holiday season is upon us, I know a lot of you will be hosting parties and be looking for a great menu for dinner. This one is SO easy, it looks great and has a lot of things that almost everyone likes making it the perfect dinner. 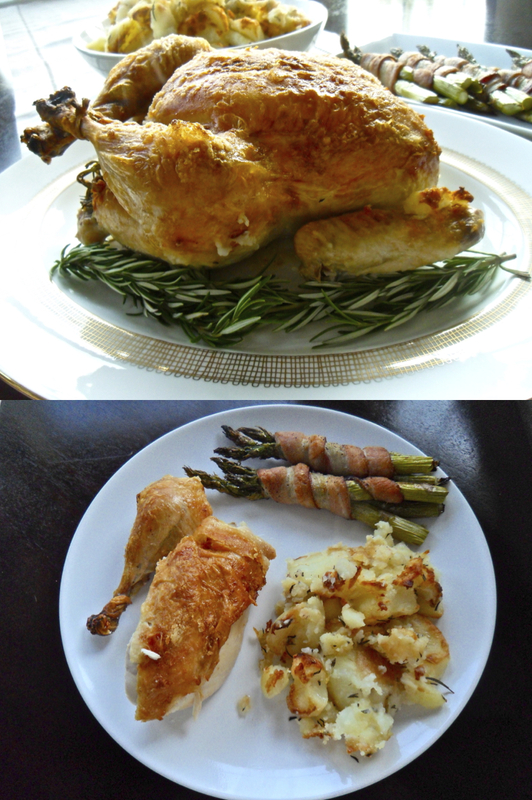 A salty and crisp-skinned chicken is stuffed with rosemary and roasted on a bed of crispy rosemary potatoes and served with bacon wrapped asparagus. We make this a lot at home for “date night” just the two of us and then make chicken salad with the leftovers but it’s great for a lot of people. This chicken will serve 4-6 people so all you have to do is make 2 chickens if you’re having more people. Start by filling a large stock pot with water and bring to a boil. We have a great Martha Stewart one that has a pasta insert that goes right into the pot… that way we just pull the insert out and all the water is drained. Peel all of the potatoes and slice them about 3/4 inch thick and drop into boiling water. Cook until tender, about 11 minutes and drain. Empty all the water out of the pot and put the potatoes back in. Shake over the heat to dry the potatoes out, this is the key to getting a finished product that is crispy and delicious. Coat the potatoes with olive oil, season with salt and set aside off the heat. Preheat oven to 450 degrees and bring chicken out to room temperature for at least 15 minutes. Mix together 1 1/2 tsp salt and the cornstarch. Pat the chicken dry with a paper towel. Set the chicken breast side up, rub the skin all over with the softened butter and season with the salt/cornstarch mixture. Stuff a few sprigs of rosemary into the chicken’s cavity. Tuck the wings under and tie the legs together with kitchen twine. 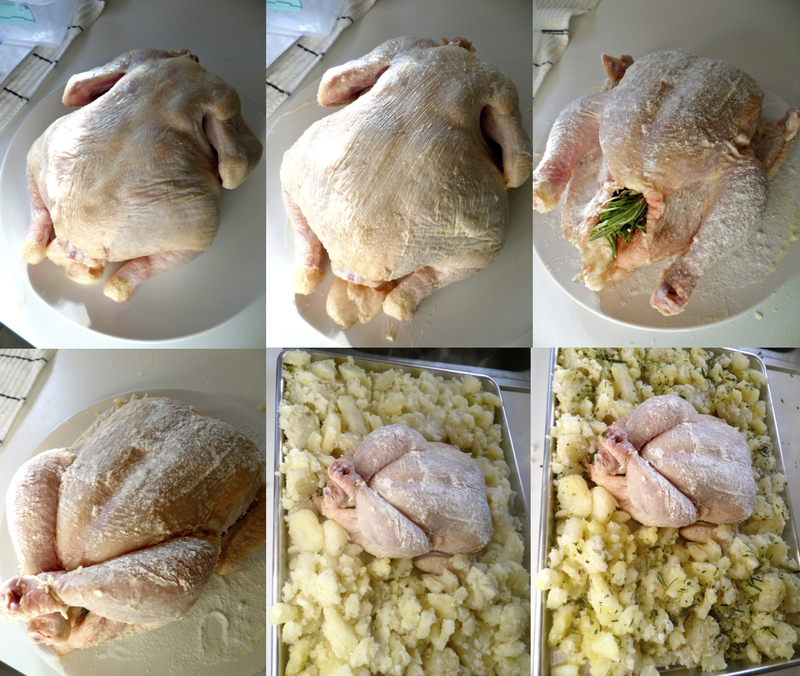 Set the chicken on a rimmed baking sheet and spread the potatoes out around it. Drizzle with a little more olive oil, chop some of the remaining rosemary and sprinkle it on the potatoes. Roast the chicken and potatoes for 30 minutes, remove from oven and flip the potatoes, and roast for 30 minutes more until the chicken juices run clear and the internal temperature is about 165 degrees. After you put the chicken and potatoes in the oven for the first 30 minutes, prepare your bacon wrapped asparagus. You can wrap each individual piece of asparagus with bacon but I find it overpowers the vegetable so I like to do bunches of 3. The best way to prepare the asparagus is to take them one at a time and bend them in half, they’ll break off exactly where the bad part ends and the good part begins. Do this to all of the asparagus and then divide them into bunches of 3. Take a piece of bacon and wrap it about 1 piece and then put that one piece on top of the other two. Wrap the bacon around the bunch and set it on the baking sheet with the end on the bottom. You could put a toothpick on the end to ensure that it won’t unravel but you really shouldn’t need to. Repeat until all of the asparagus is wrapped. Drizzle a little olive oil over each bunch on a baking sheet and season with salt and pepper. When put the chicken back in after flipping the potatoes, put the asparagus in also and cook for the last half hour. To serve the dinner, put the potatoes into a media sized bowl and the asparagus on a long platter. 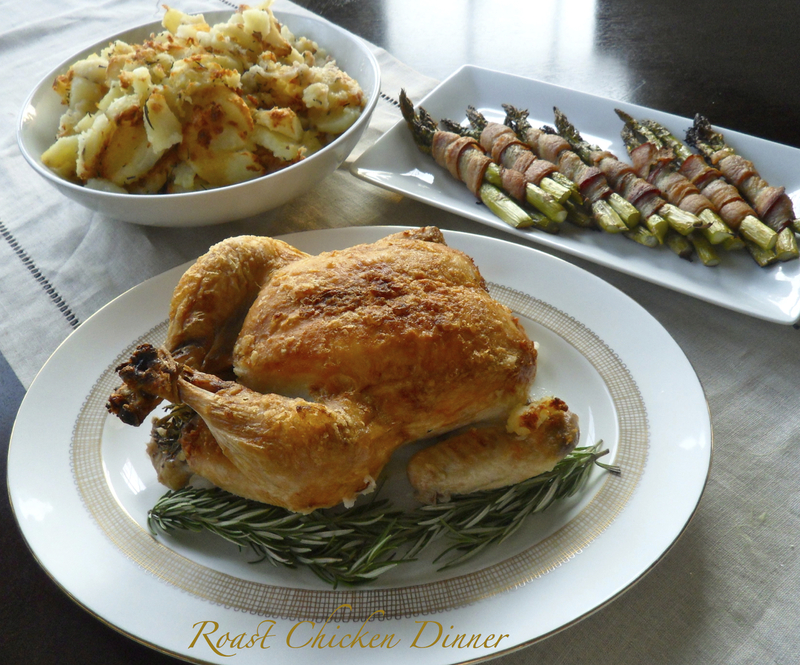 The chicken can go on a platter also and looks really nice with fresh sprigs of rosemary along the bottom. To serve the chicken make sure you let it rest for at least 15 minutes and then cut the bird in half, cut off the wings and legs and then cut off the breasts. This way you get big pieces that hold onto the skin (which really is the best part) and they’re easy to serve.